Do Employers Really Pay Attention To My Resume? This is the question on everyone’s mind when they submit a resume for a positional job offer posted online. The next questions would be: Did I put too much information? Was it too short? Did I check my grammar? Darn, did I put the right phone number and email address? This is when your head begins to spin and you make your resume a living nightmare. In the HR world, the answers to these questions lay upon the person viewing your resume, and you may find this shocking, but it’s you. You are the holder of your resume. You are the one who will disclose vital bits of information to be released into HR hands. We will go over a few key pointers so you won’t be overlooked. As a recruiter, I see about 50-60 resumes a day in my email. I sit back and drink my water and look at every single resume and maybe call about 15-25 candidates that pop out and might be a “good fit.” Then I see the magical stars that are maybe 5-10 candidates that are “perfect fit.” The big difference between a “not qualified,” a “good fi,t” and a “perfect fit” resume comes down to exactly what you put on your resume. Now, I’m not saying lie on your resume but make your resume unique and to the point. For example, you are applying for a warehouse job you need to think of how many other candidates are applying for the same job. What makes you more qualified than the next resume that comes up? Are your references ready to be called for verification? Are you interested in a long-term commitment? Did you research the company you are applying for? Will this meet your financial needs long-term? Some people don’t think of these key questions and send a random resume and they get rejected. You need to prepare yourself to make an excellent resume that will be different from the rest. So now that you have done your research and have remembered all your past employers. And you've contacted all your references to make sure they are ready for the special call. Now comes the hard part the dreaded “FINAL DRAFT” of your resume. What do employers, HR managers, recruiters really look for? Name, contact information, correct employers, and solid references. Also, please have a professional email address. I see so many funky emails come across my desk. With free email services take some time to make a professional one. Watch your spelling. Not every resume needs the right punctuation mark, but do your best to make your resume as professional as you can. Try to stay away from programmed resumes used by internet job boards. Those resumes are so basic and don’t give enough room to elaborate on job duties and skills. Design your resume to match the company you are applying for. There is no such thing as one perfect resume for the perfect job. You do not want to send a resume for customer service if you are applying for an office job. Or a resume for a warehouse worker for a construction job. Your resume should sell your skills that are a perfect fit for the job. What type of company are you applying to? Do you want to work for them? What type of benefits do they have? Is this company worth the time to apply? Ask yourself questions before you take the time to apply. It can take up to 20 minutes or more to apply for a job online and sometimes you don’t get a callback. Don’t send any resume, send an amazing resume that will get that callback. What skills do I add to my resume? As I mentioned above, add skills that match what you are applying for. Your resume should read like a summary of your past. Many people struggle on what to put under employer name. The answer is JOB DUTIES. Ok, what did you do there? You can’t list everything but list the important things. What made you an asset to the company and what were your day-to-day duties. Don’t ever sell yourself short. Make the message come across that you knew what you were doing and have references to back it up. You don’t want a five-page resume, a nice simple two-page version will do. Keep it up to five years, if you were with one company for five years then list 10 years past employment. DO NOT list any jobs that were three months or less. That makes you look flakey. “Job hopper” is what we like to call it. Now time to put it all down on paper and send this awesome resume off and wait for the phone to ring for the special interview call…. Hopefully, this helps your resume brain calm down. Don’t stress over a resume, it’s easy if you don’t over think about it. 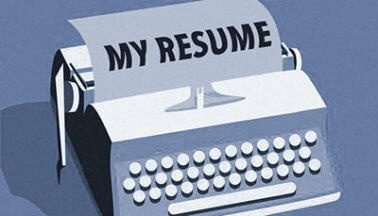 Ever Wonder How Recruiters See Your Resume?